We recently won tickets for Naomi’s Wild and Scary Show at Tyne & Opera House in Newcastle over on Here Come the Hoopers blog. The show was on yesterday, starting at 2pm and including the interval, ran for just over two hours. Our seats were in row F so we had a really good view of the stage and the little man was able to see easily. Although the show is aimed at children 5 years and upwards, the little man at just 3 thoroughly enjoyed it and was still old enough to join in. I think children any younger may struggle with the length of the show and fact it isn’t at all ‘babyish’. As we hadn’t seen the TV show prior to the stage show, we weren’t too sure what to expect and if I’m honest, I had no idea who Naomi was! I also didn’t know how an ‘animal encounter’ in a theatre would work as I knew the children wouldn’t be able to get up close with the animals on stage. 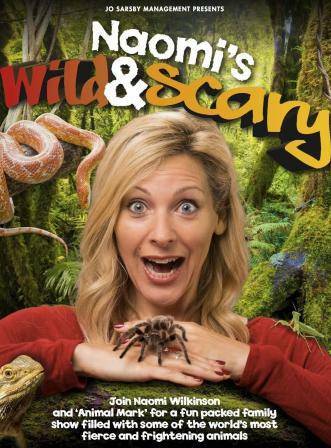 I needn’t have worried, Naomi Wilkinson (Naomi’s Nightmares of Nature, Wild and Weird, Live ‘n Deadly, Countryfile, Milkshake) was a fab host who was enthusiastic and entertaining from start to finish but her obvious fear of some of the animals makes her much more relatable and down to earth. The show starts off with Naomi dressed in a sparkly show girl number, bounding round the stage with an energetic musical intro. She introduces herself and ‘Animal Mark’ who is the animal handler for the show. He’s the man who brings out the animals for the audience to see and is responsible for the ‘trolley of doom!’. With the use of a close up camera on stage, the audience were able to feel up close and personal with various animals including a snake, a giant centipede, and a tarantula. As well as being able to see a range of scary creatures on the stage, Naomi’s journies around the world are shown in short videos on a large screen. We saw videos of her meeting a Alligator Snapping Turtle in the swamps of Florida before traveling to Belize, The United States, Costa Rica, South Africa and Borneo. The video’s were short enough to keep younger children engaged but were interesting for informative for the older ones in the audience. Naomi managed to keep us all interested and the children loved joining in with her ‘scary shake out’ and laughing at her silly songs and crazy outfits. We all thoroughly enjoyed the show and were sad when it came to an end. It was interesting, informative and delivered a thought provoking message – encouraging us to travel, learn about the ‘scary’ creatures in the world and then try and do your bit to protect them. Tickets cost £19.50 for an adult and children are £16.50. I’m so pleased you guys enjoyed it! Sounded like a fab show and gutted we were away!